Bentley, J., Boa, E. and Salm, M. 2016. A Passion for Video. 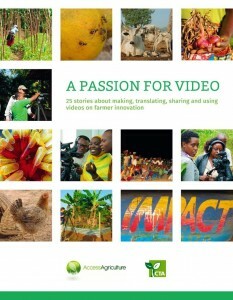 25 stories about making, translating, sharing and using videos on farmer innovation. Access Agriculture, Nairobi and CTA, Wageningen, 56 pp. Download the story book here. 12 August 2016. In November 2015, Jeff Bentley and Eric Boa worked with facilitators from ICRA and CTA in a two-day writeshop with some 40 people from Africa and Asia, helping to turn their experiences with video into short, written stories. The stories are captured in A Passion for Video, which celebrates the creativity of the many organisations involved in making, translating, distributing, and screening videos. In these stories we learn how to reach far-flung villages in Ghana on a motorized trycicle, how to inspire farmers while picking one’s way through the Egyptian bureaucracy, and how to make a video with colleagues we love and need (even if we have to cut them out of the final video). We also meet many other engaging personalities, including a villager in Benin who has to deal with neighbors who want to borrow his precious DVD of videos. Development organisations and donors do have a lot to gain by learning from people’s personal struggles to overcome hurdles along the way; a project is not just about achievements, it is also about finding one’s way around obstacles. Development projects will benefit a lot from more flexibity in project planning and in listening to what people on the ground really experienced. Too much planning stiffles creativity and rigid, number-crunching evaluation kills passion. And in the end, the readers want more stories about how things really went.